Dodgers or Rockies: Which is the Best Bet in the NL West? Bet Rockies to win the World Series at +2000 with 888Sport. Bet Dodgers to win the NL pennant at +200 at 888Sport. Bet Cardinals to win the NL pennant at +1000 at 888Sport. A year after running away with the National League West by 11 games on their way to winning their first pennant since 1988, the Los Angeles Dodgers have had to scrap and claw their way through this season, but do have a slim edge of two-and-a-half games on the Colorado Rockies with a week-and-a-half to play, having swept this week’s showdown at Chavez Ravine to seize the division lead. Not only do the Dodgers have the advantage in the standings and a magic number of eight, they have the more favorable schedule for the stretch run, or at least so it seems. Los Angeles has three home games against the San Diego Padres this weekend, then a road trip to close the season with three games apiece in Arizona and San Francisco. The Dodgers are 12-4 against the Padres this year, but 7-9 against both the Diamondbacks and Giants, the latter of whom would enjoy nothing more than playing spoiler, which is just how it played out on the final day of the season in 1982, with the Giants beating the Dodgers to prevent them from tying Atlanta for the division title. The Rockies, meanwhile, have three games left on their road trip, against the Diamondbacks, before returning home to close out the season with four games against the Phillies and three against the Nationals – two talented teams for whom this season went off the rails in the second half. The Rockies are 8-8 against Arizona this season, lost two of three on their trip to Philadelphia, and won three of four when they went to Washington. Home-field advantage has not been a significant factor for either team this year. 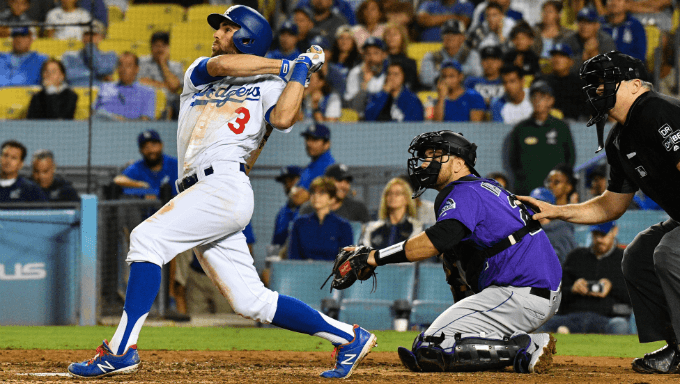 The Dodgers, in fact, have been slightly better on the road, while the Rockies have not enjoyed a typical Colorado team’s boost at their high-altitude home in Denver. While the division race sees the Dodgers at a prohibitive -1250 at 888Sport and the Rockies at a not-juicy-enough +550, both teams are ripe for wagering on deeper baseball betting futures markets because whoever falls short in the West remains in play for a wild-card spot. What is completely bonkers is that despite their tenuous position atop the West, the Dodgers are the favorite among National League teams, and third choice overall behind the Boston Red Sox and Houston Astros, to win the World Series. Los Angeles winning it all is a +600 proposition, compared to +700 for the Cubs, and +1400 for Atlanta, the Senior Circuit’s only contender not looking at the possibility of the one-and-done coin flip that is the wild-card game. The Rockies check in at +2000, a nice price to snag at 888Sport if you believe they will rally to win the division – keep in mind that the New York Yankees and Oakland A’s, one of whom will be out of the playoffs after one game, have World Series prices of +1000 and +1400, respectively. The route to go for Dodgers action, if one must, would be to win the National League pennant, where Los Angeles only on Thursday morning became the favorite, at +200 to Chicago’s +240. In this market, Atlanta and Milwaukee are next at +500 and +600, then the Rockies at +800. What those prices really highlight, though, is that the Cardinals are a nice value play at +1000 with 888Sport. St. Louis is 37-23 under new manager Mike Shildt, and while the Redbirds’ path to October would go through a wild-card game, their starting rotation depth is a good fortification against the disadvantage faced by wild-card winners of having used their top starter going into a division series. The “if one must” about the Dodgers is important, and shows starkly in the market for World Series matchups, where Astros-Dodgers is the favorite at +800 and Red Sox-Dodgers is +850, with Astros-Cubs at +900 the only other pair in triple digits. Getting in on that, at this moment, when the Dodgers are close enough to worry about a situation where they’d have to burn Clayton Kershaw in a wild-card game, is madness. Astros-Rockies at +2500 is hardly much better given Colorado’s division odds, and the Astros having to go through Cleveland and likely either Boston or New York to get to a second straight Fall Classic.